Saturday afternoon at the Quakerhouse pub is a well-established session at the Darlington Jazz Festival. 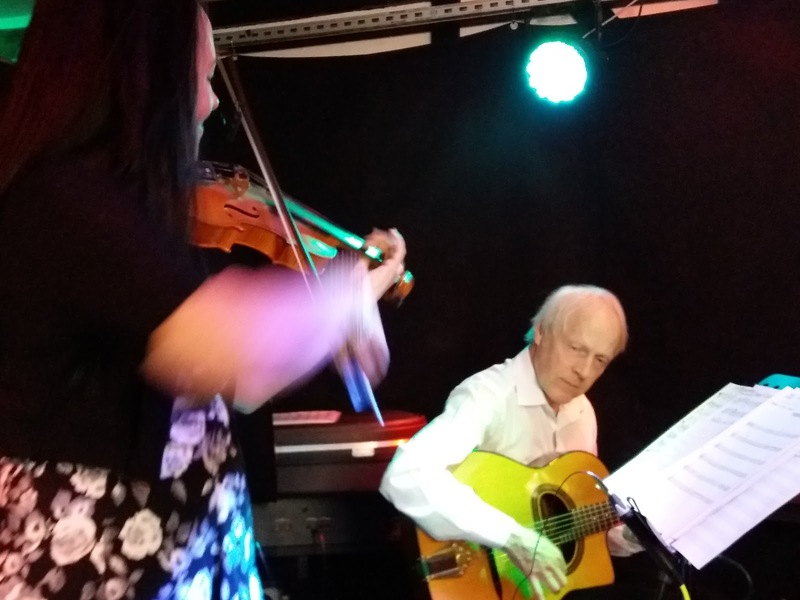 The CAMRA award-winning hostelry is home to Darlington Jazz Club’s bi-monthly gigs making it a home from home for organisers and regulars alike, the one difference being that the festival session takes place in the downstairs bar rather than in the upstairs room. The format is simple; squeeze in three sets (‘squeeze’ being the operative word) in the compact space at one end of the bar, plug in and play. Graham Hardy (trumpet, flugelhorn); Dean Stockdale (piano); Mick Shoulder (double bass). Tyneside-based trumpeter Graham Hardy arrived in good time for a one o’clock start. A trio is the optimum number given the restricted space and joining Hardy for a set of forty-five minutes or so were pianist Dean Stockdale and bassist Mick Shoulder. First, Cotton Tail with Hardy’s flugelhorn, then again on If I Should Lose You – typically assured, lyrical, playing. Mood Indigo heard Hardy on plungered trumpet before returning to flugel to play In a Mellotone alongside a Mick Shoulder solo with our bassist singing to himself as is his wont. More muted trumpet from Hardy on Benny Golson’s Whisper Not as Dean Stockdale played a relaxed, restrained, solo. Stockdale featured again on Blame it on My Youth and in no time Graham Hardy’s set wound up with Tom Harrell’s April Mist. Joe Venuti and Eddie Lang probably played many a juke joint not dissimilar to the Quakerhouse. One room, alcohol the main attraction, perhaps conversation, musicians all but incidental, typical working conditions for the legendary duo some ninety years ago. Fast forward to 2018, one room, alcohol an attraction, perhaps conversation, the musicians anything but incidental, rather the main event. Emma Fisk (Joe Venuti) and James Birkett (Eddie Lang) held court, the room crowded, the jazz of the highest order. Their programme centred around the Venuti-Lang recording partnership, including sides by the Blue Four. Sunday opened this Saturday afternoon set, Cheese and Crackers followed (Emma observing that nibbles didn’t appear to be on the bar…they weren’t), then a Venuti-Lang duo recording titled, wait for it… Sunshine! Darlington on a bank holiday, doors open wide, endless sunshine, jazz…perfect. Emma’s commentary noted one of the non-Venuti and Lang numbers in the set – Sweet Georgia Brown. Everyone knows the tune including non-jazz fans and the Quakerhouse barflies, standing, or sitting, where they always stand or sit, became instant fans of Emma Fisk and James Birkett. A one set performance doesn’t allow for too many tunes but time enough to fit in I Found a New Baby and an early Venuti-Lang duo recording (1926), the saucily titled Black and Blue Bottom. You know it’s time to go when the brilliant Fisk-Birkett duo go out on Lady Be Good. Brilliant, always brilliant! How do you fit five musicians into a crowded space, crowded when three are on the stand? With difficulty, that’s how. This is jazz, and where there’s a will, there’s a way. Fisk and Birkett made a sharp exit leaving the way clear for a five-strong Teesside orchestra to set up and start more or less to time. The Pocket Jazz Orchestra is an established five-piece band based on Teesside. A gig up the road in Darlington was on the doorstep and all five musicians have played many a gig, upstairs or down, at the Quakerhouse. It was a case of introductory solos all round as the Pocket Jazz Orchestra opened with Stella by Starlight – Mark Toomey’s alto hewn from Charlie Parker’s granite monument (there must be one somewhere! ), the classy guitar playing of Paul Donnelly, the torrent of notes comprising Jeremy McMurray’s trademark style, the five-string bass of Peter Ayton and in-the-groove drumming by Paul Smith. A bossa-like intro to Nature Boy developed into a feature for Paul Donnelly. The Wes Montgomery influence became evident as Donnelly stretched out with piano, bass and drums backing as altoist Mark Toomey sat contentedly, listening intently. Toomey himself stepped up to play a quote-laden On Green Dolphin Street – Bye Bye Blackbird and Surrey with a Fringe on Top two of many tunes referenced by the altoist – and Donnelly followed up, without quotes. Pianist Jeremy McMurray took his share of the solos, Ayton and Smith weren’t left out of things but it was either Toomey or Donnelly who shared the spotlight. The setlist was familiar, no bad thing at a free admission festival session, and on this sunniest of days, the Pocket Jazz Orchestra elected to play Work Song.